The Super Bowl is known for the commercials, but Google found the World Cup dominated YouTube ad engagement. People watched more than 1.2 billion minutes of World Cup ads on YouTube, about four times more than Super Bowl ads this year. Soccer fans watched 25.4 million views of World Cup ads on the first game day -- more than 590 million views total for this year, per Google, which released the YouTube stats Thursday. On average, brands in the top 10 ads list raised the number of YouTube channel subscribers by 18% during the past month. Since there are a limited number of commercial spots during the game -- only during halftime -- advertisers create more content especially for YouTube. The ads have become longer and more movie-like rather than short clips, keeping viewers on the site for longer lengths of time. In fact, the average three-minute length for the top 10 trending World Cup ads far surpasses the one minute average ads for the Super Bowl. The Samsung Galaxy video ad with more than 10 million views is 7 minutes long. The videos have begun to feel more like content and less like ads, as it becomes increasingly important for brands to build relationships through images -- both video and still. Google notes that Adidas' "The Dream" was the fastest-rising ad on YouTube with more than 26 million views in two days. The top trending World Cup ads on YouTube, as of June 18, begin with Shakira and Activia followed by Nike Football; Samsung Mobile; Nike Football, Itau; Adidas Football; Castrol; Nike Football, and Beats by Dre. 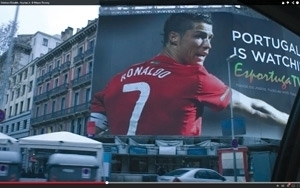 Google also tallied the viewers in the countries who watch the most World Cup ads on YouTube. Brazil leads with 61 million views, followed by the U.S. with 57 million, Mexico at 50 million, the United Kingdom with 27 million, and Colombia at 23 million. Google estimates there have been more than 596.8 million World Cup related searches since the tournament began.